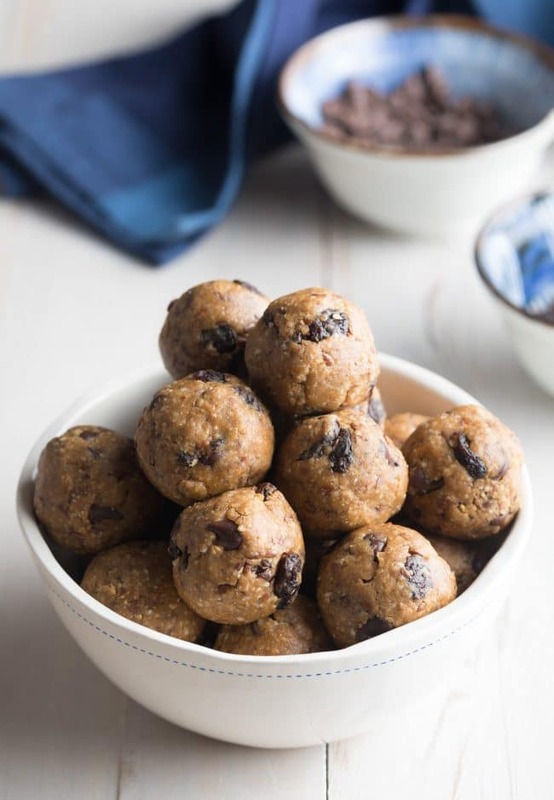 These simply vegan No-Bake Oatmeal Energy Balls, offer a healthy boost right when you need it… And they taste just like oatmeal cookies! Curb your cookie craving without falling off the bandwagon! When you are trying to stick with a healthy eating plan, snacks are generally the hardest thing to deal with. It’s tricky to find healthy got-to snacks that satisfy afternoon cravings. When the carrot sticks just don’t cut it, we bury ourselves in empty vending machine wrappers. 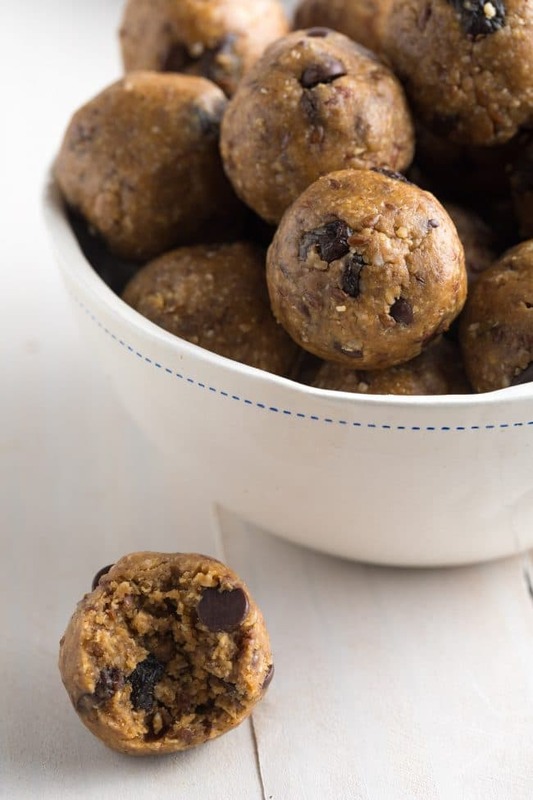 However, this simple No-Bake Oatmeal Energy Balls recipe is a game-changer. Each little energy bite is packed with oats, flax seeds, and nut butter to fill and energize you. Then a little sprinkling of chocolate chips and raisins provides that sweet satisfaction we need to stop a downward spiral. 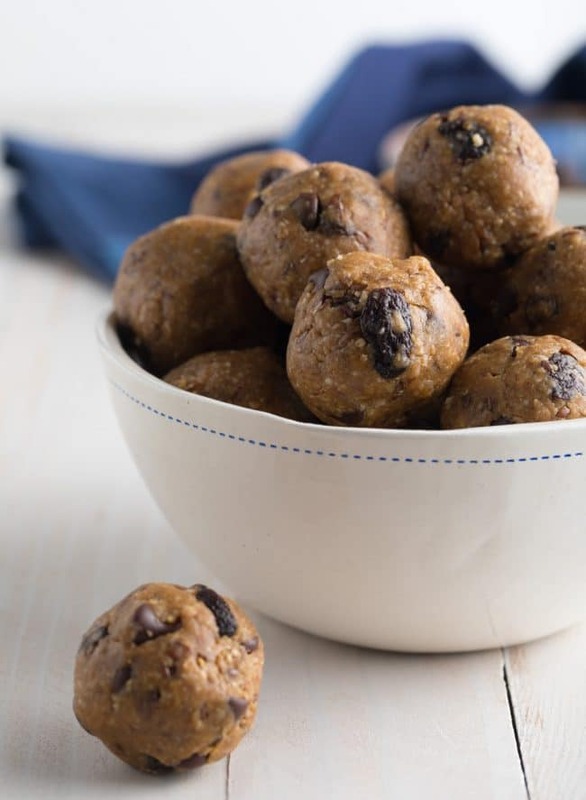 No-Bake Oatmeal Energy Balls taste like oatmeal cookies, making them a wonderful addition to lunchboxes. Yet I like to save my energy ball for about 3pm, when the afternoon slump hits. Quick oats – Using quick oats is a great start, because they are already partly broken so they mix well into the energy ball batter. 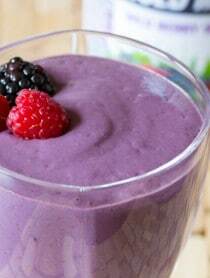 Flax seeds – Since this recipe is vegan eggs are not used to hold the balls together. Therefore ground flax seeds (mixed with any liquid) create a gel-like texture that glues the balls together. Plus, they provide fiber and fatty acids. Shredded coconut – For extra healthy fat and flavor. Nut butter – Use any type of nut butter you like. Plain old peanut butter is my personal favorite! Vanilla, cinnamon, nutmeg, and salt – These ingredients create the well-rounds cookie taste. Maple syrup – A wonderful sweetener and binder. Raisins – To continue the oatmeal cookie appeal. 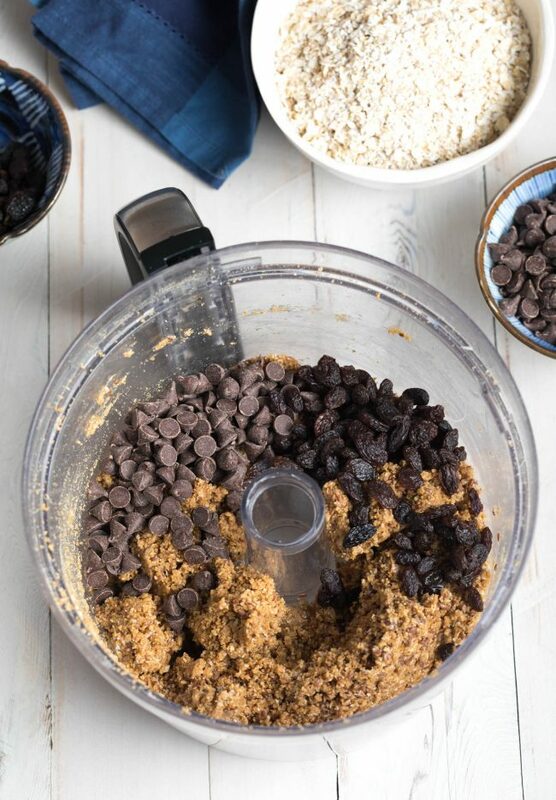 Vegan Chocolate chips – Or traditional chocolate chips, if you are not vegan. 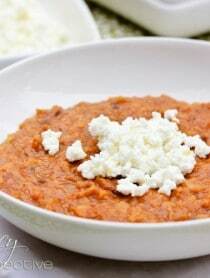 This no-bake energy bite recipe is so simple, your kids could make it themselves! First, grind the flax seeds in the food processor. They do not need to be ground into powder, but they do need to be broken up a little. Then add the oats, coconut, nut butter, vanilla, maple syrup, and all spices. Pulse until the mixture comes together into a smooth dough. Mix in the raisins and chocolate chips by hand. Roll the dough it into tight little balls. 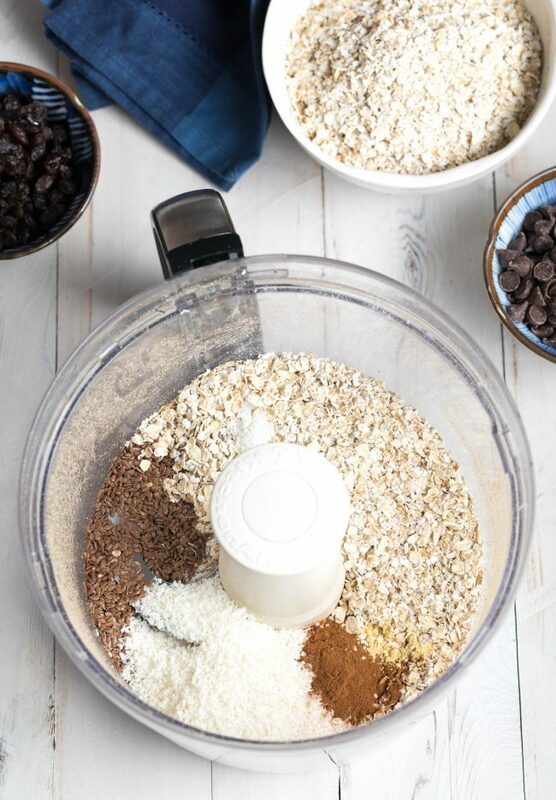 See Our No-Bake Oatmeal Energy Balls Video Tutorial & Get the Full (Printable) Recipe Below! What if I don’t own a food processor? 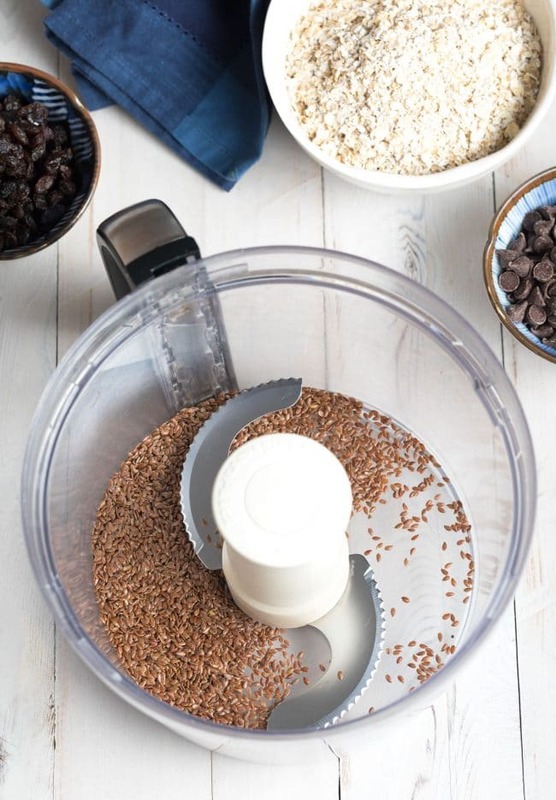 You can grind the flax seeds in a coffee grinder or blender. Then mix all remaining ingredients together with an electric mixer. Yes! 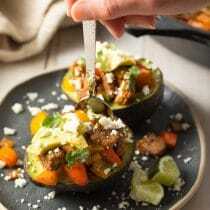 Yet then this recipe is no longer vegan. If that doesn’t matter to you, go right ahead. Can I added additional spices? Can I make a substitution for the raisins and/or chocolate chips? Yes, dried cranberries and cherries are a good choice. How long do these bites last? You can keep them in the refrigerator for 7-10 days. 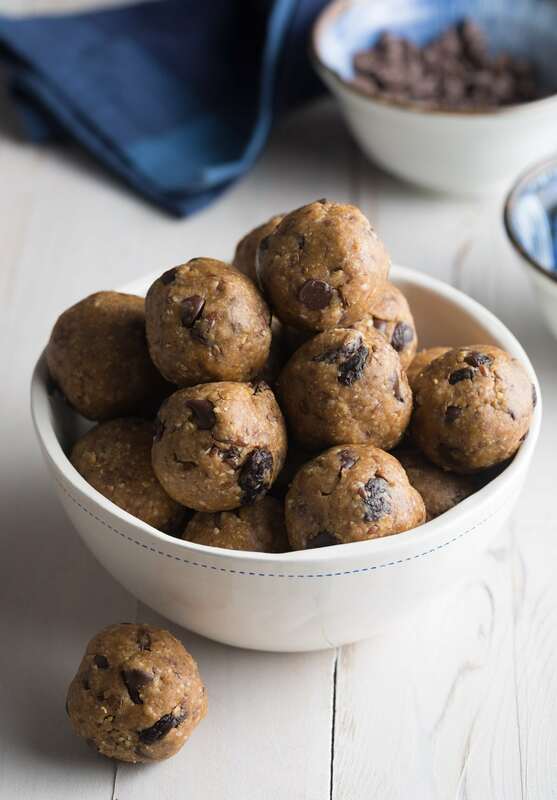 These simply vegan No-Bake Oatmeal Energy Balls, offer a healthy boost right when you need it... And they taste just like oatmeal cookies! 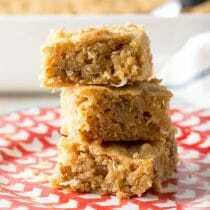 Add the oats, coconut, nut butter, vanilla, cinnamon, salt, nutmeg, and maple syrup. Turn the processor on high and mix until the ingredients form a thick consistent crumble. Add in the raisins and chocolate chips. Mix these ingredients in by hand. 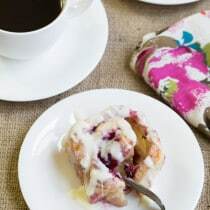 Use a 1 ½ tablespoon cookie scoop to portion out even balls of dough. Roll the dough into tight balls. 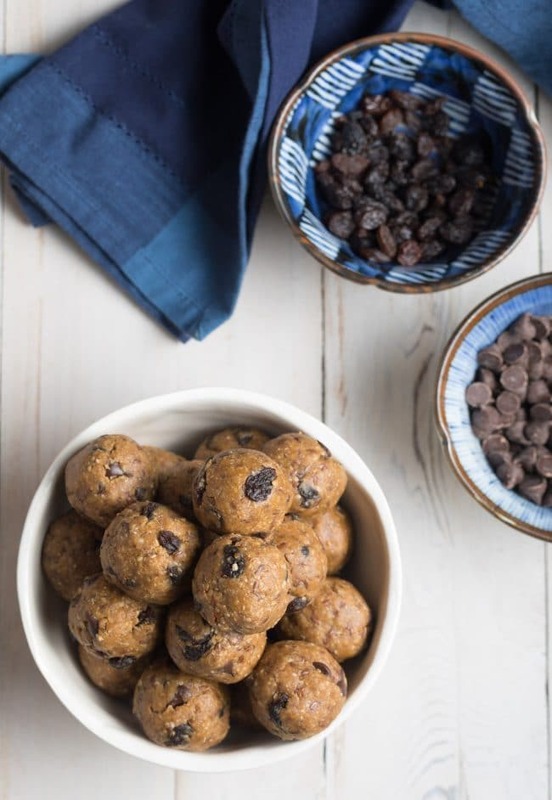 Place the energy balls into an airtight container and keep refrigerated until ready to serve. 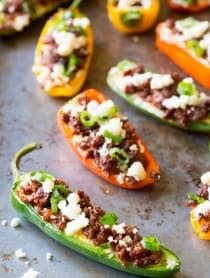 I just made these and they are incredible! I’m a snacker and something that tastes this good, I can feel good about eating these. As a cancer survivor, the flax in these balls is wonderful for me! Thanks for such an easy and great recipe. We love no bake energy balls here!! Everyone in our house loves these. 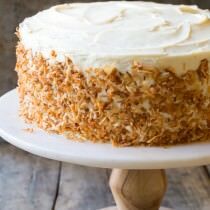 The coconut totally makes it! A new favorite snack for my kids! They love it! A snack I can feel good about eating. This is exactly what I need for a busy morning after my work out. Such a great recipe for the kids as well.